In 1826, the tiny town of Batavia, New York, was shaken by the kidnapping and subsequent murder of William Morgan. The man had threatened to expose the secrets of the Freemasons by publishing their rituals and then, just a few short months later, he was gone. The connection seemed to be obvious, and Morgan’s death sparked a series of protests against the Freemasons, culminating with the creation of the Anti-Masonic Party. There was no proof that Morgan’s disappearance was correlated with Freemasons, but they were influential and secretive, and Morgan was a dissident. The situation was ripe for a conspiracy theory — one of the earliest in America. Since then, the conspiratorial movement has only strengthened. The rise of the Internet provided a forum for all to share their ideas, however far-fetched or discredited, without ethos. It follows, then, that conspiracy theories have gained new ground. Where they were once fringe beliefs — the Anti-Masonic Party never won an election — they’ve now transformed into nationally-held views and fostered communities founded on the basis of illusion. Take anti-vaxxers, who vehemently avoid vaccines on the premise that they are dangerous and unhealthy. With the rise of the internet, they’ve organized into massive affirming echo chambers on forums like the Vaccine Resistance Movement. It’s easy to grow frustrated with anti-vaxxers’ blatant ignorance of evidence that proves the safety of vaccines. However, when we do that, we forget the origins of their outlandish beliefs: fear. The anti-vax movement is born from concern over personal or familial health, fear that the current system poses risks we don’t know, and it’s usually rooted in a negative experience with health professionals. Anti-vaxxers aren’t alone. Many of the conspiracies we see can be traced back to fear and distrust. 9/11 theories hidden away in internet forums are driven by a lack of faith in our government, prefaced by previously-exposed government plans and lies told by politicians. It’s easy to grow frustrated with anti-vaxxers’ blatant ignorance of evidence that proves the safety of vaccines. However, when we do that, we forget the origins of their outlandish beliefs: fear. But just as conspiracy theories can be framed against the government, politicians have long manipulated them for their own personal gain. Andrew Jackson was one of the first Americans to take advantage of conspiracy theories when he declared a Corrupt Bargain in 1824. Jackson lost the 1824 presidential election after a vote in the House of Representatives and quickly became convinced that Henry Clay had falsified the vote to obtain a position as Secretary of State in the Adams Administration. Despite evidence dismissing the theory, Jacksonian Democrats quickly latched onto the idea and attacked the established elite. It was a perfect plan, and it paid off: Jackson entered office in 1828. Since then, politicians from both sides of the aisle have utilized conspiracy theories to build a rift between opposing political groups or to build support for their party via fear-mongering. These tactics were brought front and center by the Tea Party movement. In their fight against the Affordable Care Act and rising taxes, they began to press the birther myth or the theory that Obama was not born in America. In pushing a nativist agenda and isolating Obama as a foreigner, they built a rift between his supposedly unpatriotic origins and their conservative, America First ideology. The birther myth and Tea Party movement were pushed into the mainstream with Trump’s accession to the White House, and he’s borrowed from their success, circulating conspiracy theories to maintain power. As the Mueller investigation probes deeper into Trump’s connections with Russia, he has begun building an alternate story where he is the victim of a hunt meant to ostracize him despite him being innocent. His manipulation has seen massive success within his own political party, in which 71% now deem the investigation unfair and a “witch hunt,” according to NPR. A tweet from Donald Trump signaling his frustration with the Mueller investigation. Of course, Democrats fall for their own conspiracy theories as well. A month into Trump’s presidency, an engineer named Yonatan Zunger published an article on Medium discussing the administration’s messy rollout of the Muslim ban. Through a combination of valid points and speculation, he stumbled upon a wild conclusion: the administration’s actions were “the trial balloon for a coup d’état against the United States.” Zunger’s unbelievable story circulated and gathered the approval of many on Medium, including the official Medium Staff account, who added it to their recommended reading list. The story swept in on the wave of a backlash against the White House and fake news, but Brendan Nyhan, a professor at Dartmouth, explains that liberals have become more vulnerable to fake news and conspiracy theories that favor their own worldview. It’s a known pattern; losing political control is directly correlated with an increased vulnerability to misinformation. Nyhan’s research shows that it’s a lot more difficult to counteract conspiracy theories than we think. Offering anecdotal evidence that disproves a point can strengthen false beliefs, and it’s harder to refute a conspiracy theory from a firm believer than one from those on the fence. The pressure placed on students from the March for Our Lives movement built as they became the biggest proponents of gun control. After a stress-induced hospitalization, Hogg took a week off from the public sphere to take time for his own mental health and escape the constant barrage of criticism from conspiracy theorists and gun activists. He was lucky to have the luxury of doing so. 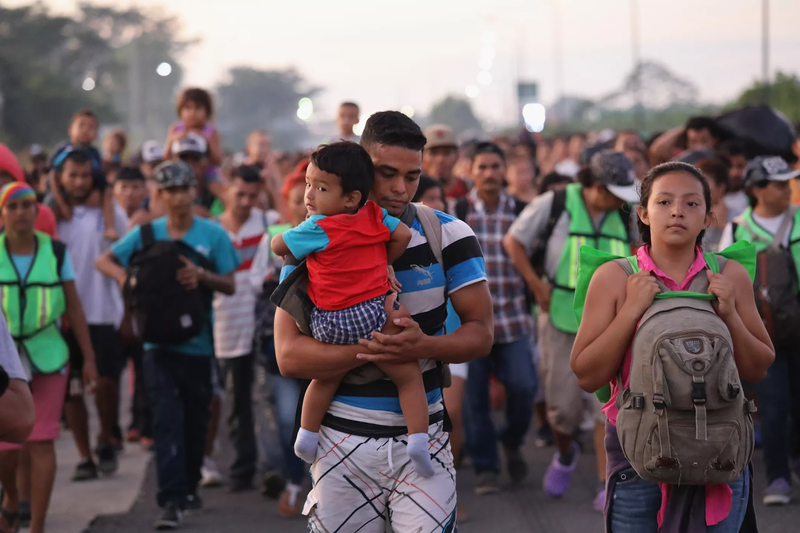 Others, like Honduran migrants, are unable to escape the 24-hour cycle of harassment and the preponderance of conspiracy theories which speculate that their true aim is to cause a national security crisis. Such an argument may seem difficult or even absurd to advance, considering these migrants’ backgrounds as predominantly poor Central Americans fleeing immense poverty, violence, or insecurity. Most intend to ask for asylum at the American border (a perfectly legal process) or have already requested it in Mexico. Nevertheless, Americans have demonized innocent men, women, and children, preventing them from getting the support and aid that they need, all for a last-minute political power grab. A migrant carries his child as they approach the border. John Moore/Getty Images. The trouble with refuting that conspiracy, like all theories, is a refusal to accept opposing arguments, leading to even more denial, frustration, and exasperated defeat. Using qualitative evidence, in fact, can lead to even firmer views. Our current situation may seem impossible, but researchers have found that the best way to approach a conspiracy theorist is with plain facts. Data from credible sources, like the CDC or the Homeland Security Agency, can change opinions, but perceptions of credibility depend on the recipient of the facts. Even with a changed opinion, consistent affirmation is necessary. Nyhen’s research finds that after a few months, people are more likely to return to their fallacious views. And each time, a careful, non-confrontational tone must be taken to avoid a retreat into denial and self-defensiveness. Changing extreme opinions may be difficult, but the eventual payoff of a clearer perspective is certainly worth it.